Enter the yeasted or raised waffle. A while back, we were served waffles like I’ve never tasted before at our neighbor’s house. When I asked her to disclose the trade secret behind such goodness, she mentioned they were “yeasted”. For some reason, it took me a few years to actually seek out a recipe – and as it turns out, they are a classic, from the Fannie Farmer Cookbook which I happened to have on my shelf as part of my vintage cookbook collection (total volumes at press time: 3). They are super easy – mostly made the night before which means you can whip them up even on busy weekday mornings, are a hit with kids and parents alike, and have the most unbelievably scrumptious texture. Light as air is beyond trite but I can’t think of a more apt description. Note: the original recipe calls for white flour and 1/2 cup of butter. For a healthier version, I substituted fine whole wheat flour (white whole wheat works great) and made the waffles with 1/4 cup melted butter and 1/4 cup flaxseed oil. Put 1/2 cup lukewarm water ((100-110° if you are curious what lukewarm means here) ) + 1 package (2 ¼ teaspoons) active dry yeast in a mixing bowl. Let stand for 5 minutes. Add 2 cups lukewarm milk, 1/4 cup melted butter, 1/4 cup flaxseed oil (or other flavorless vegetable oil), 1 teaspoon salt and 1 teaspoon sugar. Beat in 2 cups whole wheat flour. Cover the bowl. Let stand overnight or at least 8 hours (but NOT in the refrigerator). When it is time to cook the waffles, add 2 beaten eggs and a pinch of baking soda. Beat well. The batter will be VERY thin! 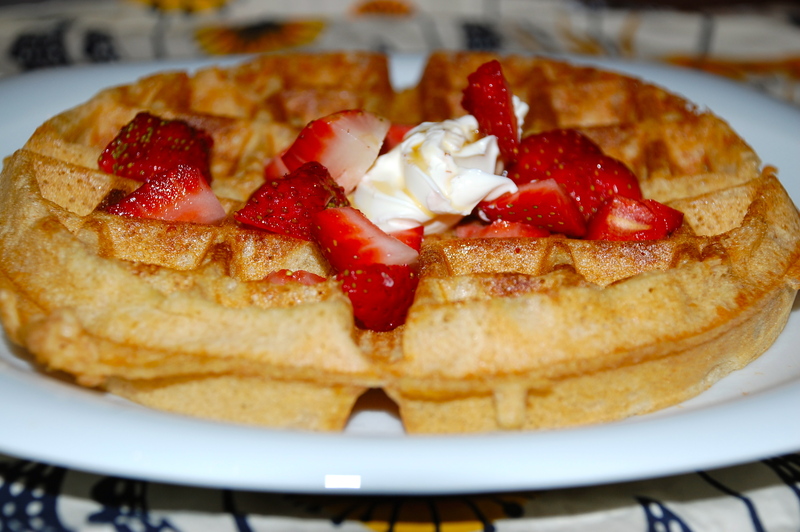 Cook with a waffle iron and top with berries, marscapone and maple syrup (as shown) or any other favorite. To follow up. Waffles were great and no one could believe they were whole wheat, even I forgot. Thanks for the recipe. Yum. My mom’s coming over Sunday for mother’s day. I think I just planned the meal. Do you mean whole wheat pastry flour? On the topic of whole wheat flour. How healthy is whole wheat pastry flour? Enjoy your Mother’s Day waffles everyone! I can’t wait to try this! We’ve done a similar version called “overnight waffles” but this sounds tastier.